Small, Puppy Dog Toy, Designed Specifically For The Needs Of Growing Puppies, Made Of Our Exclusive Soft Teething Rubber Formula Yet Retains The Strength & Durability Of Our Original Toys. Everybody loves puppies-until they chew up your shoes. It's not completely their fault: the little scamps are driven to ease sore gums and try out developing teeth. 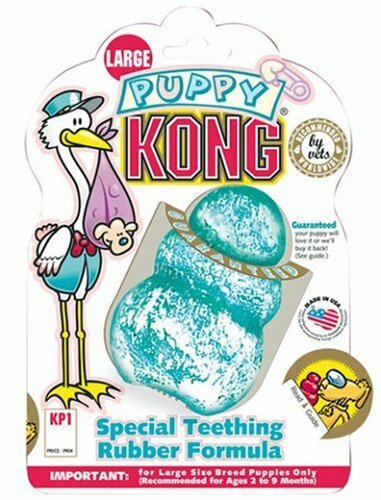 Made from a special rubber formulation that's more flexible than regular Kongs, these puppy toys make an excellent substitute for your favorite pair of Manolos, soothing teething pains and encouraging healthy mouth and jaw development. They also help puppies learn the appropriate way to channel chewing urges--an investment that will pay off over the entire lifetime of the dog. Just like big-dog Kongs, these beehive-shaped puppy chews have a goofy, unpredictable bounce for hours of chasing and fetching fun, and the hollow construction is ideal for stuffing with treats to keep puppies busy and happy while their owners are away. For a cool (though messy) treat to soothe painful gums, seal one end with peanut butter, fill with water or broth, and freeze. We recently adopted 3 wonderful, adorable pups - 2 of whom are still in their "chewing stage". Based on the recommendation of friends, we decided to give the "Kong" a try - and it's awesome! "Kongs" are made to be extremely strong, so they don't fall apart when the little ones chew on them for hours (or even when our big guy decides to have a little chewing action on it himself). We've found that our dogs love them as is, but they REALLY get into it when we insert a treat or some of the "Kong" vitamin-enriched tasty paste into the open cavity. They'll spend lots of time and energy attempting to get the treat out (which is unlikely) &/or enjoying the "tasty paste". Buy it! You won't regret it. My pom loves the puppy kong. I have also got the regular (red) one and they are the same, but the red one is stronger rubber. It doesn't matter as she doesn't really chew the rubber, but rather works for treats. She feels like a little hunter. I insert treats alone, or with peanut butter, or just her food and she goes crazy. This is a great toy to help with separation anxiety, but should also be given just for fun. I am so glad we got this toy, what a wonderful product. Thank you to the makers of the Kong! My 4 month old Cockapoo LOVES his puppy kong! It is probably one of the best toys we have ever bought him. He will spend hours trying to pry out treats after he finishes licking off the peanut butter covering the hole. I highly recommend using this to aid in crate training, as well. Fill the kong with something your pup REALLY likes (peanut butter, good treats, etc. ), put it in the crate, and shut the door with your pup outside it. I'll bet your pup will want inside! Worked like a charm for us and now Dex enjoys crate time (well...most the time).